Posted by ccdc in american, washington d.c.
An “oldie” but goodie favorite of mine is Proof, in the heart of Chinatown. It had been awhile since my last visit, and my heart fell a *little* when I saw that one of my favorite dishes in all of D.C. was no longer on the menu — the miso sablefish (an excellent sustainable substitute for the overfished Chilean sea bass). To be honest, it was a blessing in disguise because sometimes I have a hard time deviating from dishes that I know I love, especially at restaurants I don’t frequent as often. My occasional disloyalty to a tried-and-true favorite has yielded mixed results. 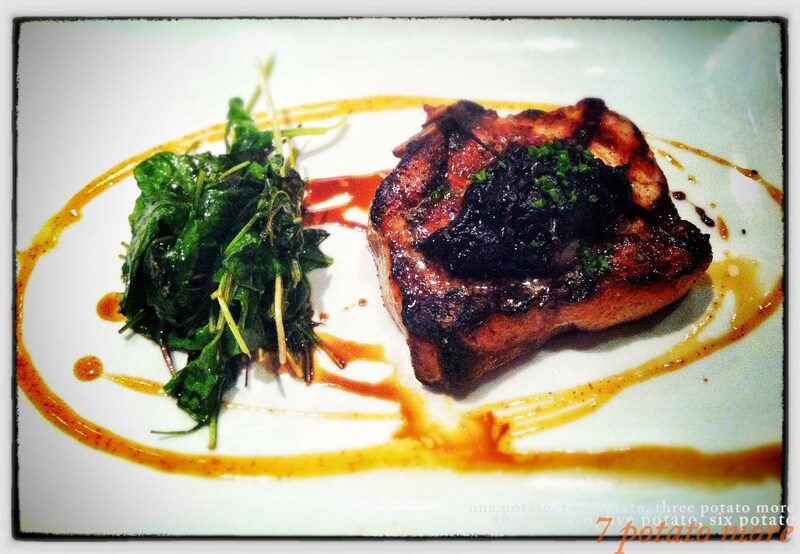 But there’s never a shortage of things I want to try on Proof’s menu, so I opted for the grilled pork chop. Admittedly, I was starving. But the chop was grilled perfectly, the greens were seasoned just right, and the onion-balsamic compote and negroni vinaigrette were a balanced marriage. And, well, see for yourself . . .
Not pictured because it was devoured before I thought to take a photo: chilled green tomato gazpacho with pickled shrimp, white corn croutons, and tomato infused olive oil. 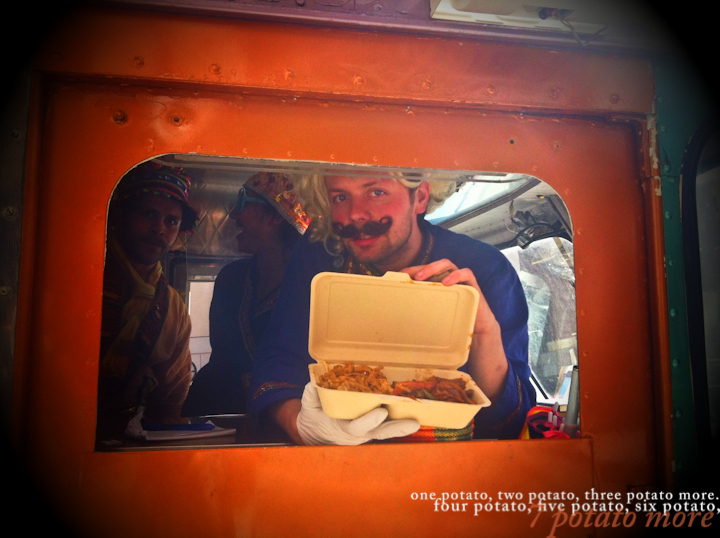 Posted by ccdc in asian, food truck, lunch, thai, washington d.c.
Fojol Bros.’ culinary carnival kingdom now includes Volathai, which serves up delicious Thai noodles and curries. 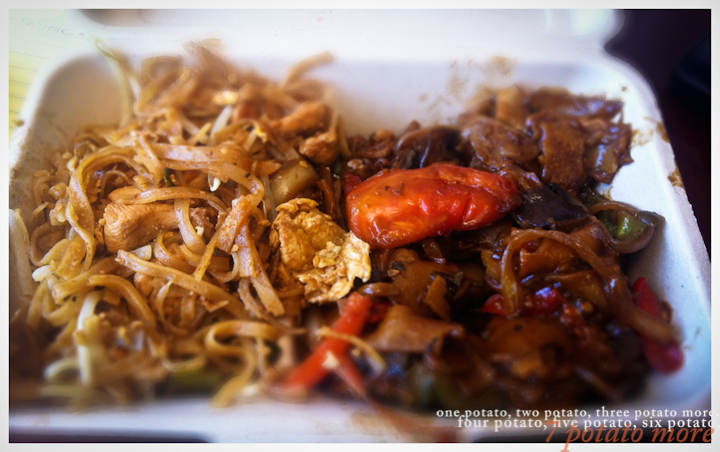 On Wednesday, I sampled the chicken pad thai and mushroom drunken noodles. Although both are good, the (portabella) mushroom drunken noodles were especially flavorful with plenty of basil. 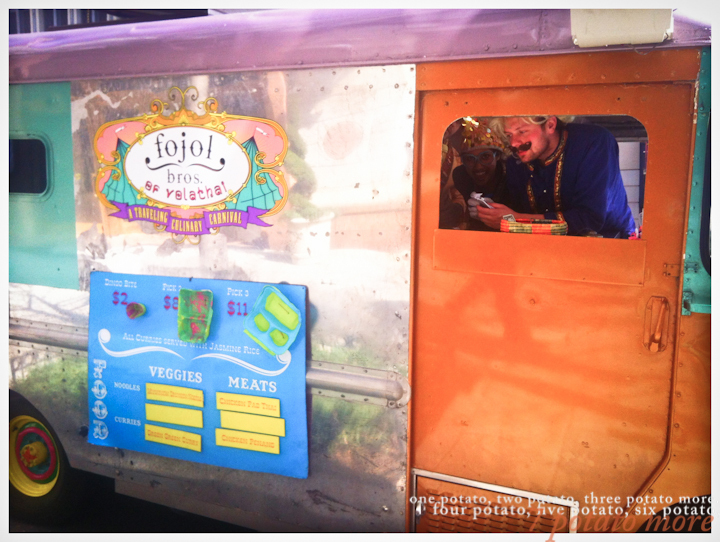 Equally good at Fojol Bros. is the consistently cheerful banter with the guys and gals staffing the trucks. 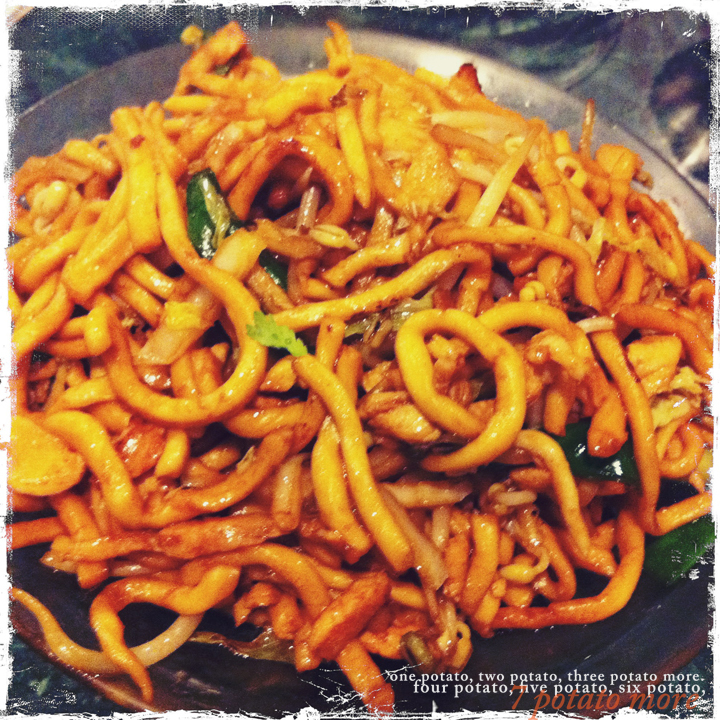 Posted by ccdc in cheap eats, chinese, noodles, washington d.c. Admittedly, I enjoy the convenience of having Bed, Bath & Beyond, a large movie theater, Chipotle, some of my favorite fine dining restaurants a stone’s throw away in Chinatown. 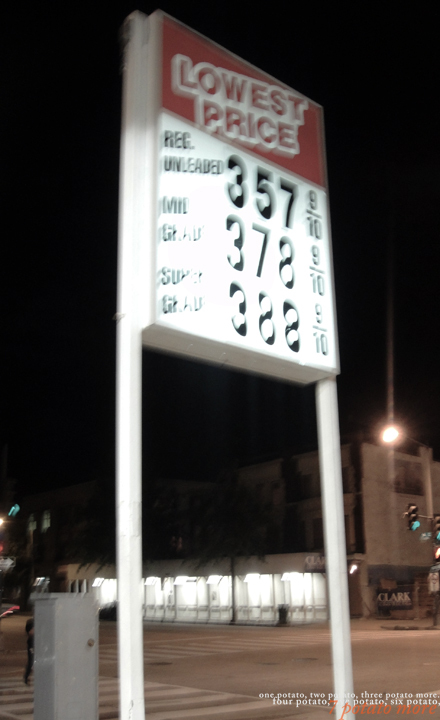 However, I wish all of it did not come at the expense of a nearly non-existant Chinese presence in Chinatown. I wish the only Chinese “market” (whose stock is limited to the most basic condiments and staples that fit on two shelves) did not also sell single-servings of alcohol. I wish the most authentic and delicious dim sum did not require exiting the District. Of the few Chinese restaurants that have survived in Chinatown, most/all cater to tourists, including Chinatown Express, at the corner of 6th and H. Tourists often gather outside the restaurant window where staff pull fresh noodles and fold dumplings. I can’t say that I would recommend sampling their entire menu, but there is one item that is a carryout favorite of mine — the stir-fried fresh noodles with chicken. Not to be confused with the chicken lo mein (which I assume involves non-fresh noodles), the fresh noodles can be ordered stir-fried or in soup and with beef, chicken, seafood, or vegetables. At $6.50, the generous portion of noodles (and it’s mostly noodles and not much else) are simple and can easily be enough for two meals (for the disciplined eater :)). Another option is to go Sandra Lee semi-homemade and beef up the nutritional value by adding your own stir-fried veggies. It’s nothing fancy. But the fresh noodles at Chinatown Express are tasty, quick and cheap. . . and one of the few reminders of Chinese in Chinatown. 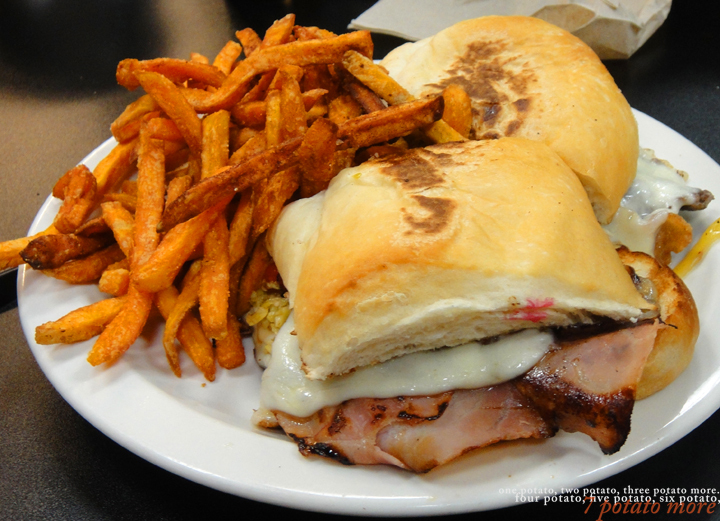 Posted by ccdc in american, cheap eats, latin, sandwich, washington d.c. 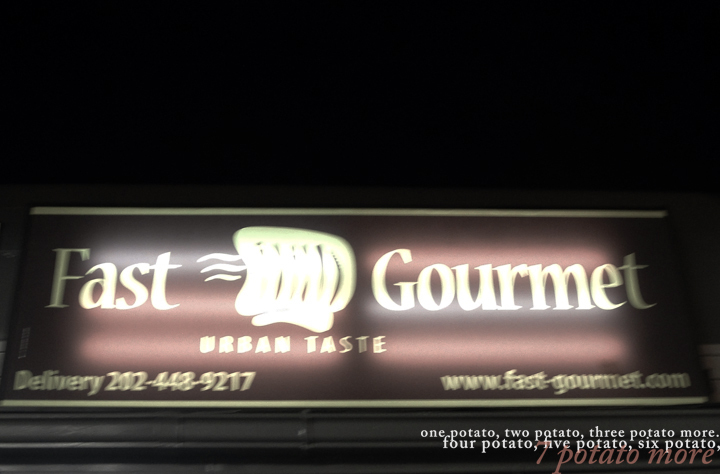 This summer, one of my friends changed the way I view gas station food marts when he told me about Fast Gourmet, the hidden but Yelp-loved sandwich shop inside the Lowest Prices gas station at 14th and W NW. Yes, inside the gas station. Honestly, I probably would not have agreed to go if not for the fact it was proposed as a post-night on U Street destination. I’d walked/driven by the gas station countless times, but I never noticed the sign above what I assumed was the attached convenience mart. Inside the mart is unlike any gas station I’ve ever seen. It was bright, clean, and had plenty of seating. Neatly printed chalkboard menus above the cash registers offer a mix of traditional American diner/deli menu items, but the standouts are the Latin-themed items, such as the cubano, empanadas, and chivito, which is (according to Wiki) a national dish in Uruguay. I haven’t had other chivitos to compare, but Fast Gourmet’s version of the sandwich includes beef tenderloin, mozzarella, black forest ham, bacon, green olives, hard boiled eggs, escabeche, lettuce, tomato, mayo, and a soft bun. Delicious is an understatement. And I’m pretty sure my assessment would be the same at 3 PM as it was at 3 AM. Of course, I substituted the regular fries for sweet potato fries, and they are also worth writing home about. Not overfried, greasy, or soggy. Crisp and well-seasoned with cinnamon and salt. 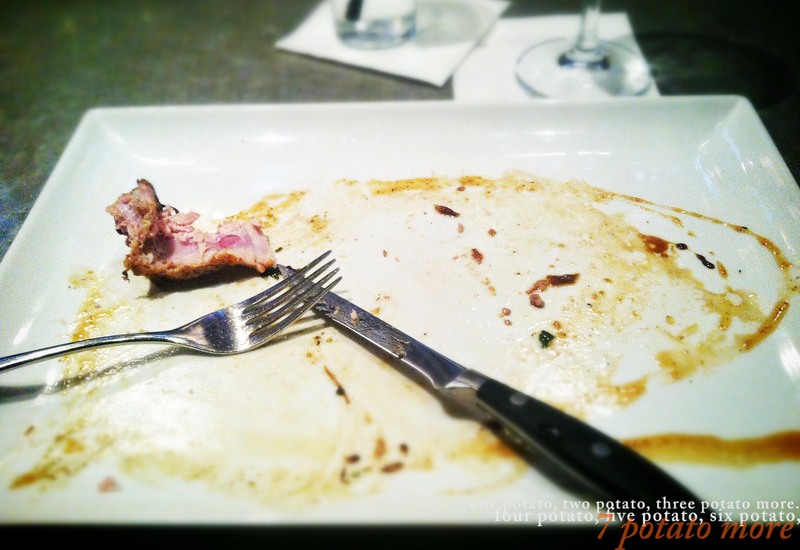 Posted by ccdc in american, cocktails, potatoes, small plates, washington d.c. 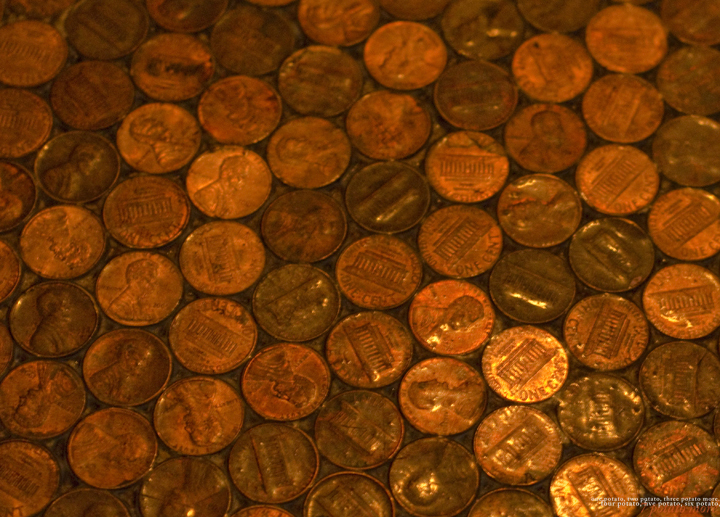 Ever wonder how Lincoln ended up on the penny? About.com has a very detailed history from a self-proclaimed avid coin collector. Although we already pay homage to Abe via that memorial thing, D.C. now also has Lincoln Restaurant downtown on Vermont Ave, where the floor is lined with over one million pennies honoring our 16th president. The interior design of the space, along with a great cocktail list, contribute to a fun and lively vibe. Lincoln features “seasonal small plates,” most of which sound delicious. So, when two of my friends and I visited for a small birthday dinner a few weeks ago, we had to exercise quite a bit of discipline to not order absolutely everything we wanted to try. In the end, we ended up with: tater tots (of course), sweet potato fries (of course x2), heirloom tomato risotto, baked cana de cabra goat cheese, coffee rubbed duck breast, poached arctic char, lobster beignets, and the strawberry rhubarb crisp. Because it was my friend’s birthday, we also got a special off-menu spiced cake dessert gratis. My favorites were the the coffee rubbed duck breast, lobster beignets (which, to be honest, really resembled hush puppies more than beignets), and the off-menu spiced cake. On my list to try next time: citrus marinated roasted beets, Meyer Farm NY strip steak, beef carpaccio & fried oysters, roasted brook trout, and funnel cake with bing cherries (which narrowly lost out on the first visit! ).